This entry was posted on December 20, 2017 by Tablebases.com. Normally, you'll see a black square or star shaped piece at the top of our table bases. That part is called the mounting plate (sometimes called a "spider" because of the shape of the arms), and has screw holes for attaching wood or other permeable table tops. Obviously, you can't attach your glass table top with screws, so instead of using a spider, you swap it for the glass top adapter. First you glue the adapter to the underside of your glass table top, so that it is securely attached. Next, it bolts down onto the base. We recommend a specific epoxy for the job, Loctite Brand Hysol Product 0151 (NOT included with adapter). That is a two part epoxy that, when dry, is optically clear. After everything is set and installed, when you look through your table top, you should just see beautiful stainless steel. We do recommend you hire a glass professional or contractor to install the glass top adapter for you. The process sounds simple, but mixing the epoxy, cleaning the glass and centering the adapter can be harder than it seems. 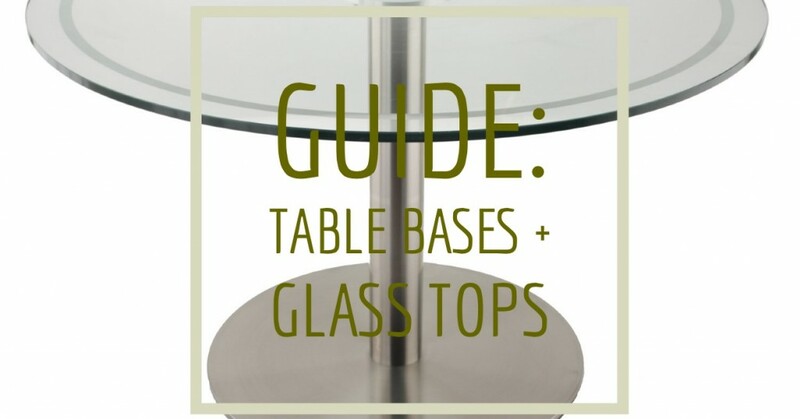 When it comes to glass table tops, many people want to set the glass on top of a table base, and let gravity hold it in place. While this may work for some applications, it is not something we recommend. It's always best to have the table top firmly attached to the table base, for safety and stabilities sake. That way, if someone knocks the table, or there is a natural disaster like an earthquake, the table top is much less likely to be damaged, or worse, fall off and injure a guest. For more information about our glass top adapters, feel free to contact our customer service agents. We have instant chat available on our website, or you can call 1-800-258-2320, or email support@tablebases.com.